Wouldn't it be lovely to have a thought-provoking wedding favour for your guests to have as a talking point around the table on your special day. To have something to take away with them to treasure those special memories of you as a couple? 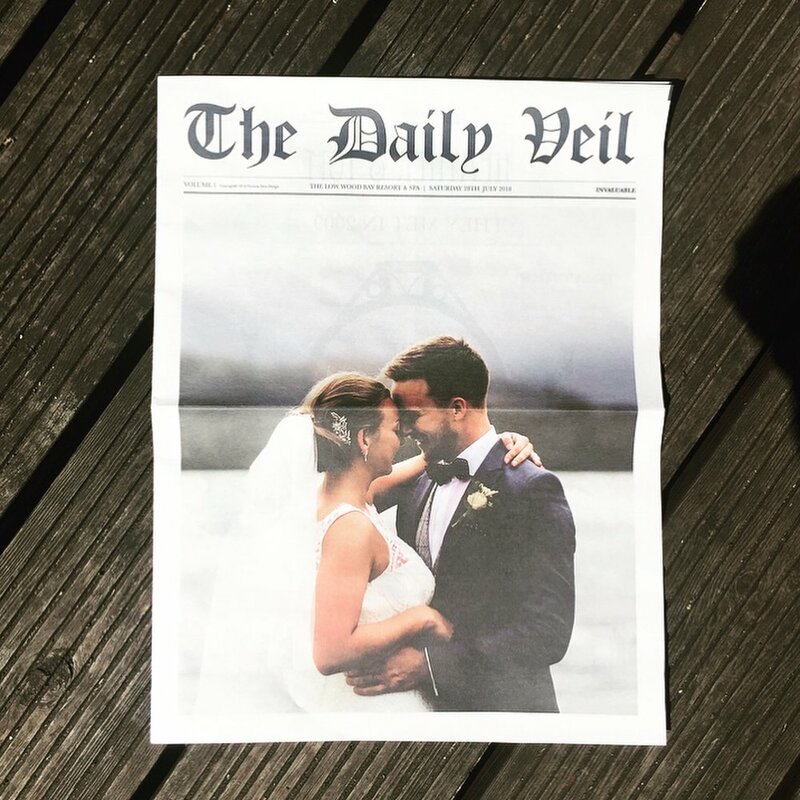 I created The Daily Veil, for Brides and Grooms to capture those moments and have something tangible to give their guests on their special day. Something that is informal that can 'bring someone to hysterical laughter or a moment that sheds a happy tear.' Guests can walk away with not only the memories of the day but also a way of getting to know the couple a bit more and read their personal story of how they both met. View a sample here. You can use The Daily Veil as either a wedding invite, a wedding favour or even a thank you paper for your guests to receive. THE JOURNEY of how you met, from your first date, holidays and adventures together, the proposal etc. PERSONAL MESSAGES from close friends and family about you both. HEN & STAG DO photographs of the fun times that you had with your friends celebrating the last days of 'singledom'. Obviously only the ones you want to share!! LOVELY PHOTOGRAPHS from your engagement shoot, or personal photos that are special to you as a couple or even old wedding photographs of family members. TOP 10 Mr & Mrs Q&A's, the option of a quiz page for your guests to fill in. SONG LYRICS/SPECIAL QUOTE from your first dance song or a quote that is meaningful to you as a couple. All newspapers can be ordered in 20, 50, 100, 150 quantities. Bear in mind couples will usually share between two. You may want your guests to have one each but you may also want to consider sending one to loved ones that may not be able to attend your big day. I ask all couples to fill out my questionnaire and send it to me via email, along with any images you would like to include. I will then create your paper and send you a proof for you to approve before it goes to print. Voila! In addition I can also create headline posters for your big day, with headlines of your choice! My aim is to keep the art of receiving something beautiful and sentimental alive. When working on my own brand I wanted to ensure story-telling, nostalgia and heart-warming sentiment was at the forefront. Whether it be your own Wedding Stationery Collection, an Occasion Newspaper for a special event or celebration, or creating a Brand Style for your business, I want to help capture and preserve your own beautiful stories. So what's my story? Well if you haven't managed to get your hands on a copy of The Sentiment newspaper that has been circulating recently, then have a read here. There in the photograph below is my Great Great Grandad James stood outside his Grocer's Shop in Blackburn 1918, during the First World War. George V was on the throne and it was the year that rationing was introduced so food was shared fairly and everyone got what they needed. People would go to the shop for pats of butter and would take there own jugs for milk to scoop from the churns. Along with sugar, flour etc. These were all weighed out and put in a brown paper bag. He also sold newspapers which is what inspired my brand. When my Grandma was little she said " I used to go and sit in the back of the shop in the living room where I would look through a beautiful bible, it had a big brass clasp and beautiful illustrated pages." With our ever-decreasing attention spans, most content is delivered to our mobile phones/tablets. There’s something beautiful about receiving a heartfelt handwritten letter or a lovely card in the post, but this is slowly dying off. That positive feeling when you receive something thoughtful in the post that is tactile and that you can treasure is quickly being replaced by emails and e-cards. Even WhatsApp and social media posts are used to wish us all good will. Everything is at our fingertips at the click of a button but what do we do with these memories and moments? We share those memories/photos on our Facebook pages or Instagram feeds, where friends and family quickly like and comment on them but they are soon forgotten. When your phone storage gets full you upload them onto I-Cloud or onto your computer and there they stay. When do you ever make time to flick through them? Reading from newspapers and magazines offers a memorable, leisurely experience, that same experience as when you go to your grandparents’ or parents’ house and flick through a photo album. I want to help bring that experience back to life. To gather your stories and create something that you can read and reminisce with your loved ones. The art of keeping memories and storing them. But also to have an item that you can take home with you and treasure. The newspapers alone are fantastic talking points, to engage your guests and to get them talking to people who they may not have met before. They are also lovely gifts that can be given by a friend or a family member but also from your close family and friends as a group gift to break down the cost. If you would like anymore details regarding any of my services just email me, I look forward to hearing from you. In the meantime, enjoy making those beautiful memories. My bag is 'nearly packed', loaded with all the essentials ready to start my new adventure, that will be solely from my desk! Yes, I know, I would like to say I am going on a year long trip of a life time, travelling the world on 'Eat Prey Love' quest of self-discovery but the logistics and the amount of luggage I would have to carry, including my two young children would be an impossible task to say the least! However, anything is possible and the thought of sitting on a beach with a laptop watching the children play in the sand sounds like the idyllic dream life. However, if you have young children of your own, you know that is not quite reality. So that little dream will just have to be put on hold. Wedding Stationery Collection - Your bespoke collection will include your invitations, order of services, table plans, table names, signage and your own logo mark. This is to help couples visualise and ‘brand’ their special day. To make everything look visually cohesive. To create something personal and unique to the couple themselves that reflects their individual personalities. Occasion Newspapers - To capture and preserve memories to pass down generations within a newspaper. To give a tactile favour to guests at an event/celebration that is essentially not just a treasured keepsake but a talking point that brings people together, that brings someone to hysterical laughter or a moment that sheds a tear. Like a time capsule that can be archived in the family for generations to come. Branding - I will be offering a 'styled brand book' for small businesses to help give clarity and value to the brand. Providing the fundamental tools to start building your own story and capture your audience. I'm open to other creative collaborations and projects so please contact me if you would like to chat. I would love to help you create something special and preserve those lovely stories.